I found loads of great new companies/products at the Allergy & Free From Show a few months ago, one of them was NutriStrength. I was pretty happy with my old protein powder but once I found out how clean NutriStrength’s whey protein isolate was I had to buy a tub. Ok, prepare yourself for possibly the longest free from list of any food product, ready? 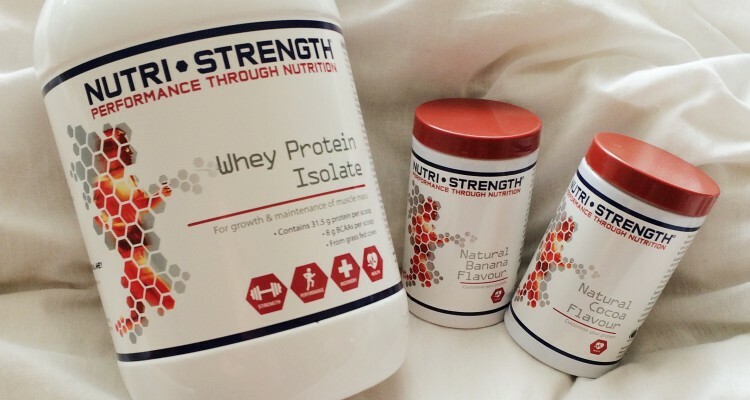 NutriStrength’s whey protein isolate is free from added sugars, artificial sweeteners, flavours and preservatives, salt, wheat, gluten, soy, corn, egg, yeasts, nuts, starch and shellfish. As if that’s not good enough, it’s also non GMO! It’s made using vegetarian whey and each scoop contains a huge 31.5g of protein, as well as 8g BCAAs – those are great amino acids that basically help to boost your muscle growth. If there was such a thing as a superfood protein powder I think this could possibly be it! Oh, and just so you know, I paid for the protein so this isn’t a sponsored post. I just loved it so much I had to tell you about it. 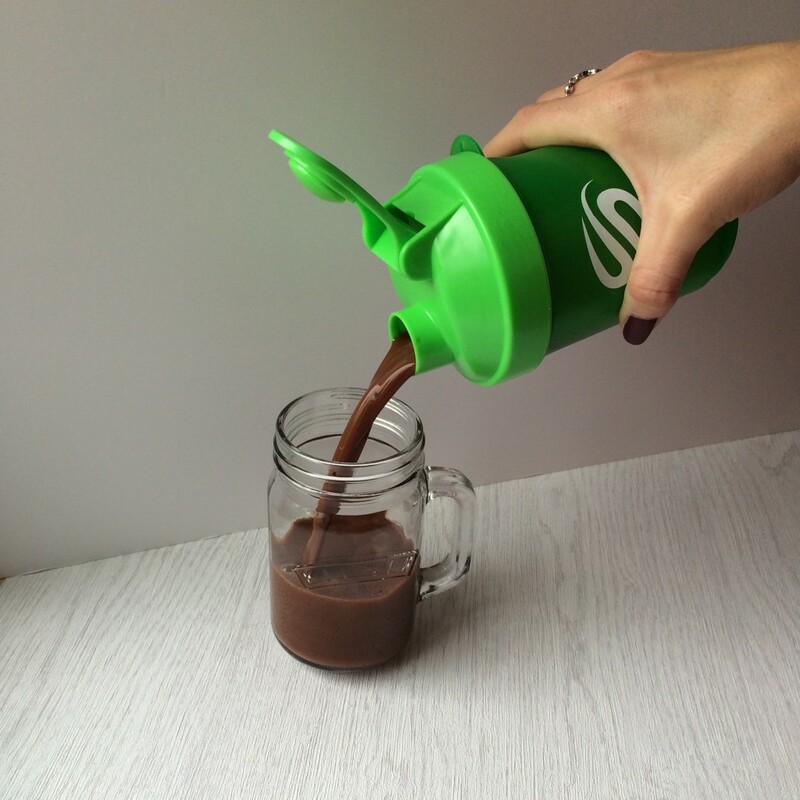 We all want a good protein powder that gives us plenty of nutrition and (obviously) protein but it really does need to taste good too…and this tastes amazing! The actual tub of whey protein isolate is unflavoured and you buy small tubs of flavoured dry powders to make the flavour you want – I chose to buy natural cocoa and natural banana. The banana flavour is nice but the cocoa is incredible! I have to admit, I tried the banana first and liked it but as soon as I tried the cocoa the banana was a distant memory…sorry banana. The cocoa flavour actually tastes like a chocolate milkshake, and because it’s free from sugar and artificial sweeteners you don’t get that powdery residue taste that some protein powders leave in your mouth. The lovely people at NutriStrength gave me a few ready to drink protein bottles when I bought these products so I’ve actually tasted almost every flavour and I’d say the strawberry is a close second to the cocoa for me. All of the protein powders taste so pure and I’m loving how my muscle gain is going over the past few months! NutriStrength is all about performance through nutrition and I love knowing that my protein isn’t full of junk. With the whey protein isolate 1kg tub costing £44.99 plus £11.99 for a flavour tub it’s a bargain! I got in touch with NutriStrength and they have kindly given me an exclusive discount code for you guys to get 20% off on their website! Add the products you’d like from their extensive range to your online cart and enter NATALIE20 as the discount code when you checkout to get your exclusive 20% off.